The Craft of Mimi: Easter mix media page. Hello! I hope everyone had a great Easter break and is feeling as creative as I am! Oddball Arts is hosting another fabulous challenge on the blog this time it is a Spring Challenge so feel free to add your amazing spring creations to the competition. For the Easter occasion I created my very own mixed media page which I then used for cards. I love the idea of creating your own personal masterpiece and sharing all the love with close to the heart. Lizzy is also hosting a challenge on her Facebook page so hop there and say hello! You can take part too as there are great prizes to be won. Here is the link to Facebook group called Oddball Art Stamps by Lizzy Love . Here you can find a link to Lizzy's amazing Etsy shop to purchases her digi stamps and other great creations. I started this page by colouring the digital image from Lizzy's collection. I used my Promarkers and my newest purchase and love A Wink of Stella clear pen. I wish the picture could give justice to the shimmer but unfortunately I am not as skilled photographer as I wish I was. Then I painted the background using my watercolour set and stamped the border using archival ink. Next step was making my own stencil and just by using a single punch hole in the acetate I managed to create this small spots using white acrylic paint. Next step was finding some papers and washi for banners and I am just in love with those pastel colours. After adhering to the page I added the basket and using my watercolours once more did some shading. The only thing left to d was to add the sentiment printed with my labelling machine and all done! Simon Says Stamps - Make your own background. Thanks so much for taking time to look at my work! 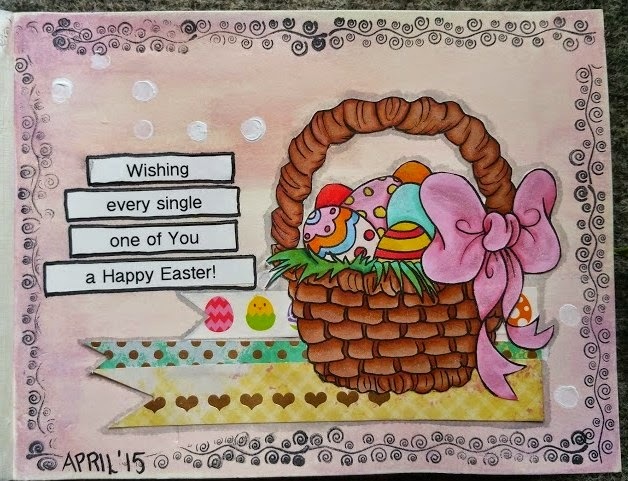 A fabulous Easter card Monika, a lovely watercoloured background and border stamping. Your image is gorgeous and lovely details! !